Every so often we buy part of a cow. This way, we can get really top-quality beef for a fraction (under $3/pound finished weight) of what we would pay in a store. 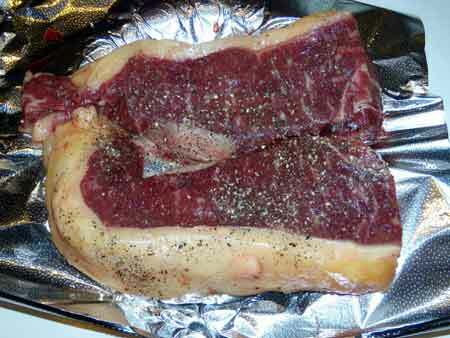 This afternoon we picked up this year's hind-quarter and thawed out these two New York Strip steaks. Dust them with kosher salt and fresh ground black people Pepper, kiss them on a hot grill for a little over two minutes/side, let them rest for five minutes and they were perfect. The fat takes on a wonderful old ivory color when the critter is grass fed -- much higher nutritional value. Served with a couple of ears of California sweet corn (still four months away from the local product) and some baby lima beans cooked with salt and butter. I am very happy and stuffed... Heading down to the Blacksmithing conference for tomorrow and Saturday. This page contains a single entry by DaveH published on April 22, 2010 9:55 PM. Methane in the news was the previous entry in this blog. Back in town is the next entry in this blog.